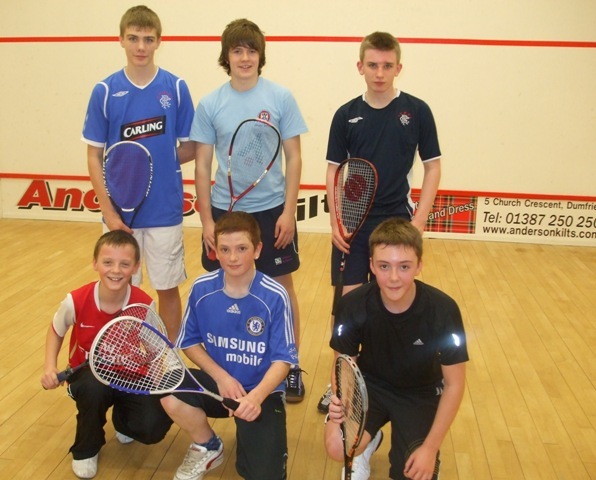 19 year old Jordan Currie from Dumfries has recently qualified as a Scottish Squash UKCC Level 1 Coach. The 2nd year Edinburgh University P.E student who is a member of Nunholm Squash Club as well as of his University club is hoping to pass on the necessary guidance and skills to the juniors members who attend the popular Junior Clubnight which takes place on Sunday evenings from 7pm-9pm within Dumfries Sports Club. The Scottish Squash UKCC Level 1 course saw Jordan have to undertake small assessments including written questions on Health and Safety, Child Protection and Mini Squash as well as having to undertake an Independent Coaching Assessment. Jordan was tutored by Simon Boughton, the club professional and Scottish Internationalist who is based at the Edinburgh Sports Club on all aspects of the junior development programme which incorporates the relevant procedures for the foundation skills for all squash shots. For all those interested in trying squash or racketball come along to the club on Sunday nights from 7-9pm, all equipment is provided. For any further information contact Raymond Currie, Junior Convenor or Jordan Currie on 01387 257036 or the club itself on 01387 252527.